Since man first stamped on the earth or clapped his hands, making rhythm has been a part of life. Rhythm is there in all the music we hear, whether it's a Beethoven symphony, the backbeat of rock 'n' roll, or the subtle suggestions of jazz. In many parts of the world it's not the drum kit as we know it that provides the rhythmic base, but percussion instruments like congas or even triangles. All of these are part of the arsenal of the drummer/percussionist. A drum kit can be as large or as small as you wish - anything from a snare and bass drum to something consisting of over 20 drums and a huge Chinese gong (as some progressive bands of the 1970s liked to display). At its heart is the bass or kick, drum, played by the foot, using a pedal. The snare drum, which is hit, uses stretched, coiled wire underneath to make its sharp, cutting sound. You can also find "tom-toms," either attached to the bass drum or freestanding. They come in different sizes, providing varying, deeper notes. Also a standard part of the kit is cymbals, thin metal discs that are hit for accents. The hi-hat cymbal is actually two cymbals together, one on top of the other that can be played with either the foot on the drum stick. The two other main cymbals in a drum kit are the ride and the crash. The ride is generally played for rhythm, whilst the crash is strictly for emphasis. Sit on the drum stool so your right foot is on the bass drum pedal and your left on the hi-hat pedal (people who play left-handed will need to reverse the way the kit is laid out). Take one drum stick in each hand. Begin counting repeatedly and slowly to four. Each time you say "one," bring your foot down on the bass drum pedal. On "two," hit the snare drum directly in front of you, using the stick in your left hand. On the third beat, kick the bass drum again, but twice, very sharply. Then on four, hit the snare once more. On paper it sounds easy. But when you try it, you'll discover that it takes concentration - and a while to master so it sounds even and natural. Once you've practiced that basic backbeat pattern until it's become second nature, you can add another layer. 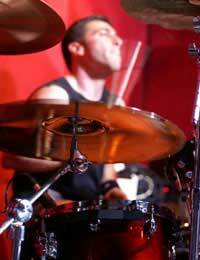 With your left foot, push down on the hi-hat pedal to close it, and keep it that way. Now, as you play the drum pattern, use your right arm (keeping it above your left arm) and hit the hi-hat cymbal on each of the four beats. Once again, it'll probably take time and effort to play properly. Drumming takes co-ordination. The best drummers, whatever style they play, are incredibly well co-ordinated; they can make it seem like their four limbs operate completely independently and still produce a perfect mesh of rhythms, often shifting emphasis as they go. Listen to Tony Allen, for example, the African drummer who was behind Fela Kuti's sound, or even Ringo Star, whose sound was pared-down, but fitted perfectly with the Beatles. Sometimes the secret can actually be to play as little as possible, as the classic soul records illustrate. Once you're comfortable with this basic pattern, you can vary it a little. Instead of using the hit-hat, play the four beats softly on the ride cymbal, and bring your foot down on the hi-hat pedal for emphasis when you hit the snare drum. Instead of the snare on the fourth beat, you could add a flourish on the tom toms. Try playing a bar - four beats - with the first and third beats on the kick drum, and using the sticks on the tom toms. Whatever you do, it takes practice, and lots of it. What's above is the basic beat for rock 'n' roll. From there, you can develop. Listen to what other drummers play and copy their patterns. Play with other musicians and learn how the drums work with different instruments and in different styles. There are so many different percussion instruments that it's virtually impossible to list them all. Every country has their own, sometimes with only subtly different sounds. What they have in common, whether it's the claves (two stick struck together) or congas or even xylophone (which is classed as a percussion instrument) is that they're played with either hands or sticks (even the Indian tablas are hand drums, with iron filings glued to the skins). Perhaps the most commonly used are the congas, hand drums that stand on the ground, and the darabuka, a goblet-shaped drum held between the legs. Congas are usually in pairs, one tuned high, and the other low to give a variance in sound. Played with both the flat of the hand or just the fingers, you'll discover that the tone varies, depending where on the skin you hit. The same applies with the darabuka. Building rhythm on hands drums is different from a drum kit. The beats aren't as emphasised. You still play a pattern, but it's more complex. Some cultures, such as Arabic and Indian, have traditional patterns or rhythms for the hands drums to play, and all aspiring drummers have to learn these. In the West, we're much freer. We don't tend to have set patterns - what you play simply goes on how you feel, responding to the other musicians. Yet that doesn't mean you can play anything. Just like the drum kit, you need to develop a rhythm, emphasising the first beat of each bar (ONE-two-three-four). From there you can add or even subtract things. The pattern you play is up to you, but it should be full enough to provide support without distracting from the melody of the other instruments. It doesn't have to be fast, but hand drums depend on subtlety. You have to listen carefully to what others are doing. Percussionists, however, don't just use hand drums. They have an arsenal of equipment to provide different sounds or emphases. It could be something as simple as a string of bells or the claves (which are often used in Cuban music). In music where you find several counter rhythms (such as Brazilian samba), a group will use several percussionists, each playing different rhythms and building layer by layer.